Alas, we have another installment of Mama Rose Recipes! I know that most people don't think of chicken thighs as being a healthy meat, and I agree, it is not the best for you. However, this recipe has so much flavor going on, it is hard to resist. So we compensated with a salad and roasted vegetables as our sides. While I was making dinner on Monday night, Ryan came into the kitchen and asked if he could help. 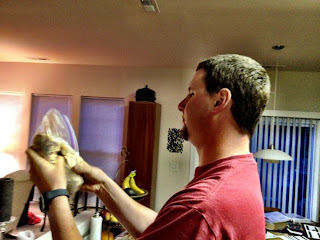 As usual, I was multi-tasking like a champ and asked him to help put together the marinade for the next's nights dinner. He asked if it was the thighs and instantly got a huge grin on his face! So needless to say, this is actually a dinner that we "both" made. His favorite part was shaking the mix around. I do want to note that I made a few mistakes with this. I accidentally bought skinless, boneless chicken thighs (not good when you are trying to get a crispy skin)! And they were smaller than bone-in, so they took less time to cook. I also didn't put the thighs on a parchment-lined baking sheet, but in a baking dish...not a good move if trying to get them crispy. The lesson here: READ THE RECIPE ALL THE WAY THROUGH BEFORE YOU START! In a medium bowl, whisk together the buttermilk, olive oil, lemon juice, rosemary, chili sauce, garlic, salt and pepper. 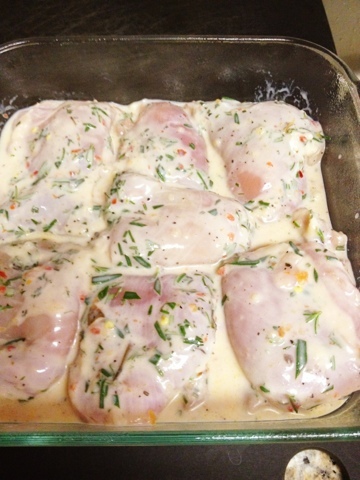 Place chicken thighs in a large ziploc bag and pour marinade over. Turn bag over several times to coat the chicken and place flat in a large shallow bowl. Let this marinade in the refrigerator for at least one hour and up to 24 hours. When the thighs are ready to be cooked, preheat the oven to 375F and arrange the chicken thighs in a single layer on a sheet pan lined with parchment paper. Spread any remaining marinade from the bag over the thighs. Bake for about 35-40 minutes, or until the chicken is cooked through. Turn the broiler on high and broil for 4 minutes until the skin is crispy and golden brown on top. I also use this marinade for grilled shrimp and scallops and it works well (do not marinate more than an hour on seafood). 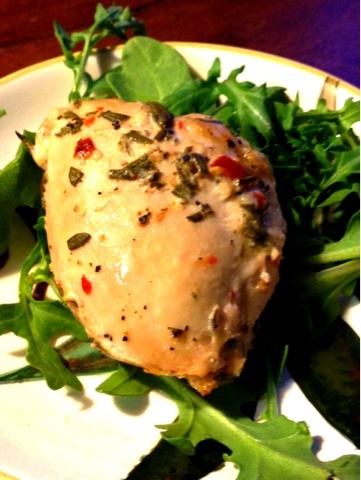 Loved this marinade so much I also tried on chicken breast on the grill - great! !